Paper 9 1/2" x 5 3/4"
Four-color process printed on Side 1 of uncoated 80lb Smooth White stock. H1 business card slits on pocket. Known for precision auto detailing, SweetCars printed this design's flap with a photo of a car interior. 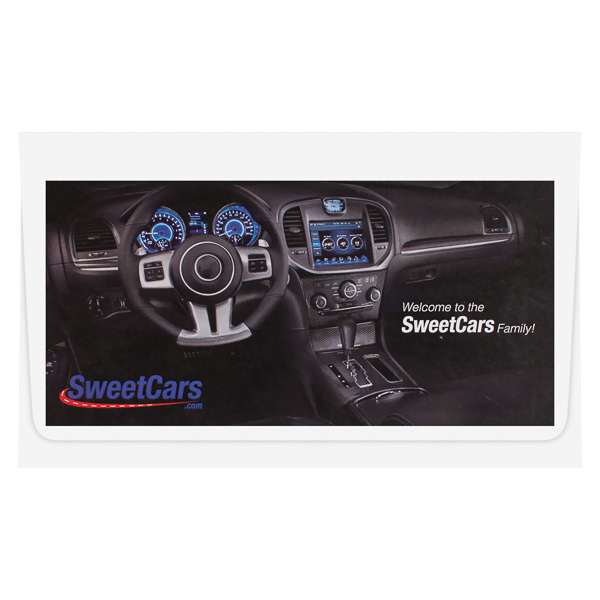 Blue dashboard lights match the SweetCars logo at the bottom to work the brand name seamlessly into the image. A curvy chrome line splits the back panel into two parts. The logo, contact info, and slogan appear on top. Below, a collage of logos highlight the autos that SweetCars sells—from American sports cars to Europe's best. Four-color process printed on Side 1 of uncoated 80lb White Smooth stock. H1 business card slits on pocket. 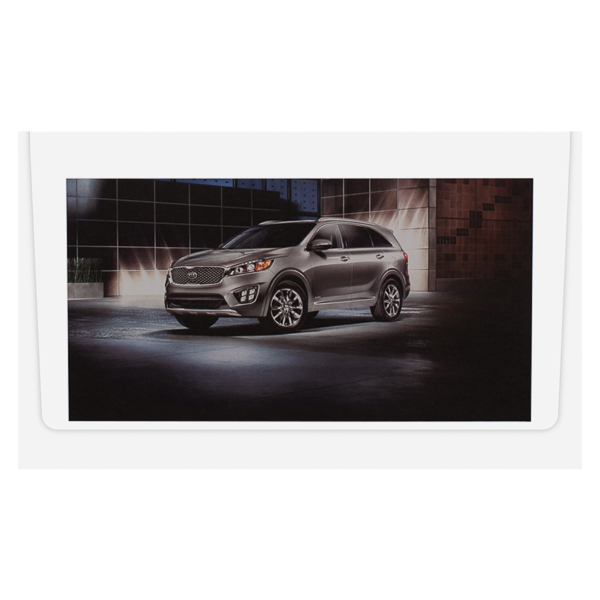 West Virginia auto dealer A & B Kia imprinted the flap of this design with a detailed illustration of a new Kia SUV. The image's use of white lighting and dark neutrals creates a sleek, powerful look. Blank lines on the pocket let sales representatives write in the details of new car owners' purchases. The back panel likewise includes plenty of space for labeling alongside the dealer's hours and contact information. The gold Chevy bowtie stands out on this blue logo. 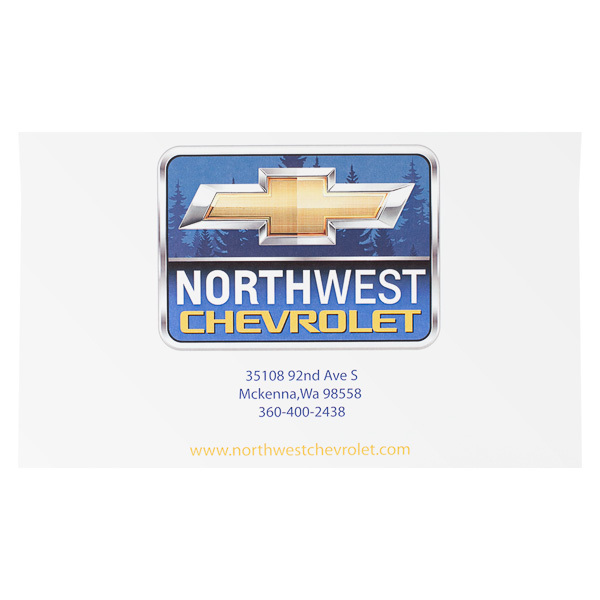 Pine trees in the background allude to Northwest Chevrolet's location in Washington State; the blue area behind the company name lacks imagery to keep the text readable. Chrome accents top off the logo, reminding customers of their shiny new cars. Contact info is listed in the blue and gold brand colors. On the pocket and flap, fillable forms let drivers write service records and take down information in the event of an accident. 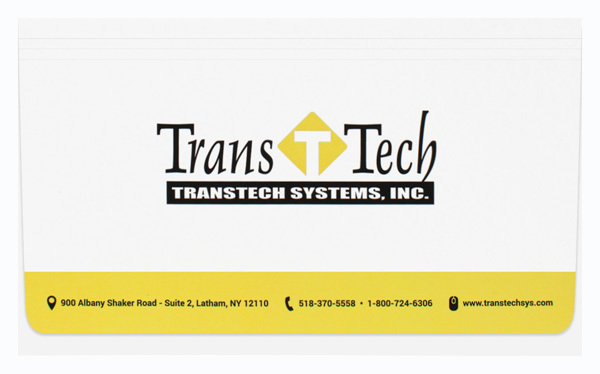 TransTech’s black, white and yellow color scheme makes its information stand out. The black serif font in the name indicates Trans Tech is respectable. Its logo, a yellow diamond, uses negative space to make a capital T. Company contact information stands out against the yellow background at the bottom of the flap. The color branding continues on the back with a yellow message on a black background, so customers know important documents are enclosed. Images of other Trans Tech products line the bottom. This modest product relieves the stress of option overload by helping you make quick and easy design decisions. Its clean, simple look puts all the attention on the contents, which can include 9 1/2" x 5 3/4" print materials and letter-sized papers folded in half. Digital printing produces clear, crisp images. With your choice of stock, you merely have to submit your custom text or graphics. Print limitations apply: design elements are limited to 50% or less of the product's total surface area and cannot cross score lines; this lets you streamline your design by including only the most important elements. Dimension Closed: 9 7/8" x 6"
Dimension Open: 9 7/8" x 11 5/8"
Acceptable Insert Sizes: 9 1/2" x 5 3/4"